so pretty and cosy about rustic wood furniture juxtaposed with soft, pastel hues. My wardrobe and draws are both pine, which is notoriously difficult to treat, but I'm so pleased with how they came out. I love to stain untreated wood furniture myself for a homemade, personal touch. This was also the month my dream came true and I had the opportunity to collaborate with the brand at the heart of all my shabby chic dreams, Sass & Belle. 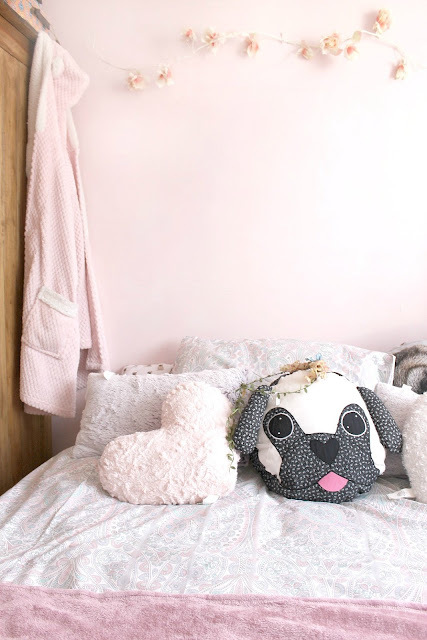 After getting in touch with their team, I was kindly sent a few items to review, including the Pablo Pug cushion, Ivory Rose garland and Cream Romantic hand mirror, to help decorate my space in romantic flair. Also included was a sweet little canvas bag extra, which I've hung on my wardrobe door. Sass & Belle are a wonderful home decor company and there's so many delightful things to find on their website, from wedding essentials, to nursery decor, to fun family home accessories and quirky cushions. There's something for everyone and everything is of a very high quality! How adorable is this Pablo pug cushion? It's a really lovely size and has the cutest floral pattern and heart shaped nose. I am becoming such a hoarder of pug novelty items, they are so sweet with their huge eyes and cinnamon roll tails. Oscar loves to borrow this in his cot! My favourite places to shop for bedding are Asda George and Primark, as they have such decorative and dreamy, decadent, affordable home collections. I try to go for reduced sets where a pillowcase or such is missing, or wait for the sales for home shopping, as you can save a lot this way. I love to mix and match the pastel colours and patterns together! My bedding at the moment is from Primark and features a double sided pastel bohemian mandala pattern. Sass & Belle have a huge selection of rose garlands, in all shades of pink, red, cream and even light up varieties! I eventually went for the pink and ivory garland to match my room and I love it arranged above my bed. It's really bendy and easy to arrange or twine around furniture. It's really sturdy too and I want to collect more and fill my whole room with them! I love a flower crown or ten and found this one in Ravens, a beautiful fair trade gift shop, down in Stourport on Severn in the West Midlands. I love the leafy trail and pretty hydrangea like flowers! Not only do they look magical when worn, but add a lovely vintage, whimsical feel to a room when placed on a bedside table or bookshelf, or hung on a bed frame. 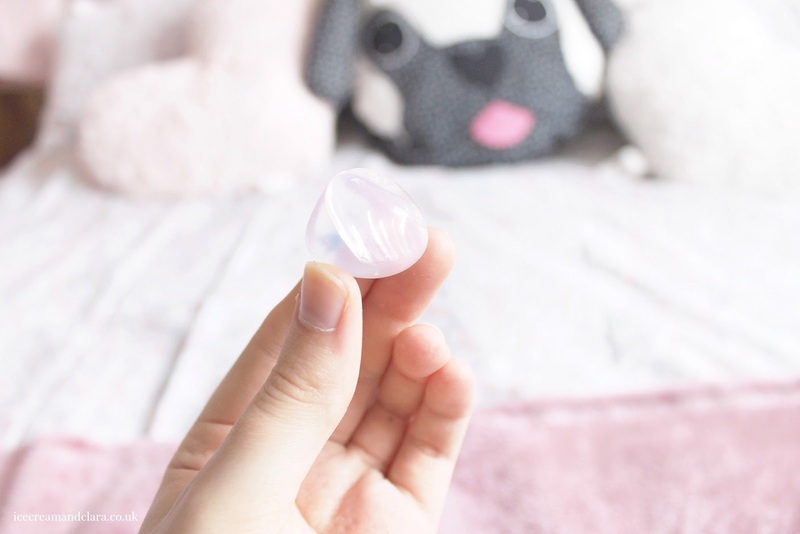 I also picked up an opal gemstone for my crystal collection. I wonder if it's true about your crystal "choosing you" and there is a reason behind the one you pick. It's really fun to imagine, and I was immediately drawn to this stone by its gorgeous polar landscape like hues. It gleams all shades of violet and forget-me-not blue at once within the crystal shell. 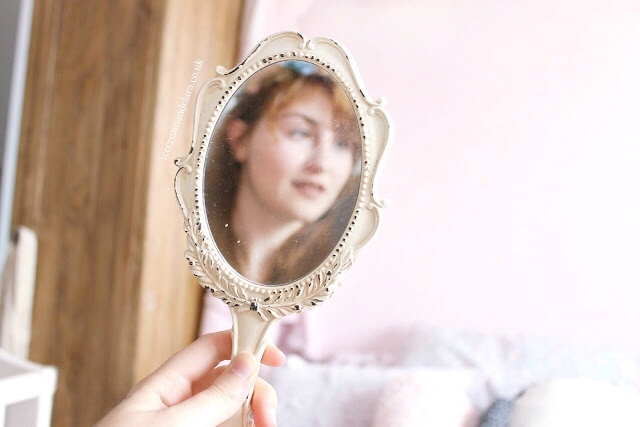 This vintage style hand mirror is such a romantic touch. I've been lusting after one like this and I love the ornate detailing and the flecks on the paint exude shabby chic vibes. I always think it's little features like this that come together to give a room its personality and flair. One thing I'd love to collect for my room are art prints, maybe some framed Pre Raphaelites or poetry quotes. I'm so in love with The Lady of Shalott poem, it's one of my favourites! Your room looks lovely! I love that hand mirror!! I love the pretty pastel pink you used! The rose garland is gorgeous, as is everything as! OMG! I am in love. I want your room! Everything is so beautiful and I adore that hand mirror. Hope you are having a nice weekend. Super cute, love the romantic/girly elements! Your room looks absolutely amazing! I love the pastel color you chose for your wall and the way everything ties in together so well! Your room is sooo lovely! I'm totally in love with your room, it's so pretty ! Lovely space. The pillow is so cute. how pretty it looks ! It looks awesome! I love this style! this is such an adorable room. I adore Sass & Belle items! Really lovely, I adore how you treated the wood to tie it in more with the room. 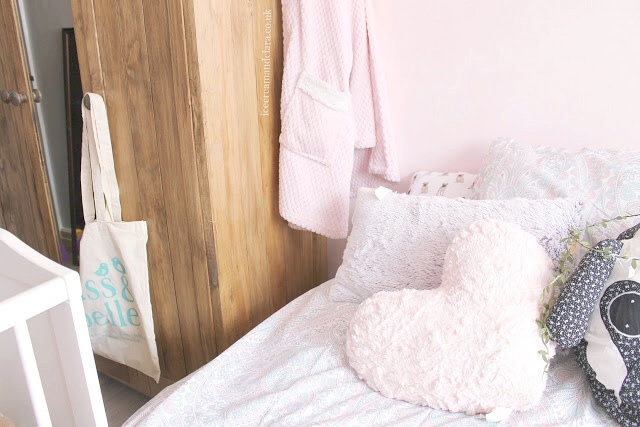 We also adore rustic furniture and pastel colors together, your room came out so beautifully! You have a great eye for decoration, we're seriously thinking of getting a pug pillow like yours too!